Alex Lahey put out an EP earlier this year and I somehow didn't cover it. She played D.C. earlier this year and I missed that due to work commitments and I regret that. And now, having heard the absolutely superb I Love You Like A Brother, her new album that drops on Dead Oceans on Friday, I am determined to make up for my mistakes in the past and trumpet, loudly, how wonderful this Australian woman's brand of indie-pop is. A record that is seemingly that rare "album full of hit singles", every cut on I Love You Like A Brother positively pops with the sort of contagious joy that New Wave used to have. 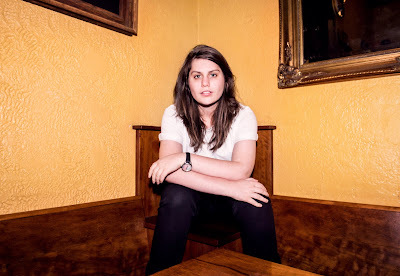 From the buzz of opener "Every Day's The Weekend" and on to the delightful title cut, Alex Lahey commands this material like an expert. The ebullient and witty "I Haven't Been Taking Care Of Myself" marries a faint glam-stomp with the sort of bright pop-crunch listeners haven't heard much of this decade for a number that is instantly buried in your ears. Blissfully punchy, this is power-pop of the very best sort, closer to old Cheap Trick singles than it is to current Courtney Barnett ones. Elsewhere, "Awkward Exchange" offers a mid-tempo dabble in electro-pop, while the more successful "I Want U" serves up New Order-style textures underneath a vocal delivery that's equal parts Chrissie Hynde-style bravado and vulnerability. Lahey is a remarkably charming singer and it's hard to believe that this is her first full-length album given how successful so much of this is. Still, the more introspective churn of "There's No More Money" wasn't as memorable for me, even as the complex "Lotto in Reverse" seemed to suggest that she's got a knack for melding her witty lyrics with something more intricate, the hook a big one still, even awash in electronic sheen. Delightfully self-assured and full of the sort of material that one used to proudly call New Wave, the tunes on I Love You Like A Brother are just things of joy. Winning the prize for "2017 Record That's Easiest To Instantly Love", this Alex Lahey release is just a blast. I can think of few other offerings this year that have yielded so many cuts to put on mixes for the car stereo, if you know what I mean? Bits of The Plimsouls, The Go-Go's, and Fountains of Wayne are here as influences but it's Alex's charm as a front-person that really makes so much of this work so well. What an enjoyable record this one turned out to be! I Love You Like A Brother will be out on Dead Oceans on Friday. Follow Alex Lahey on her official Facebook page.